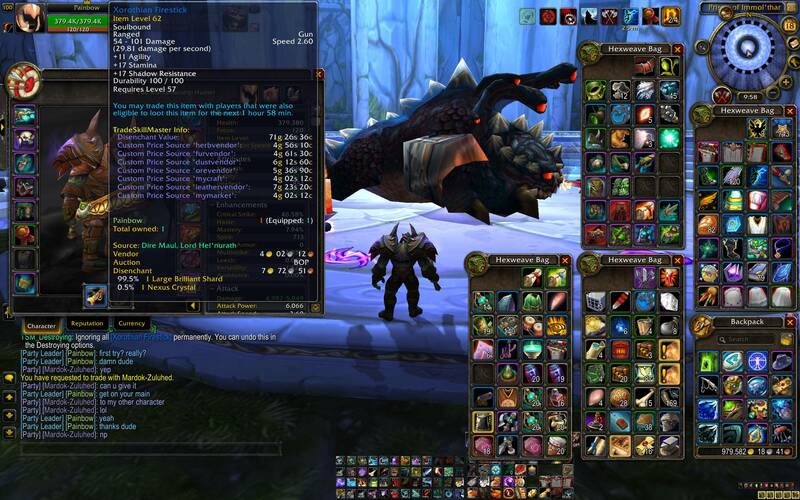 This gun drop's from the boss that warlock's need to get there epic mount. Only way to get ths gun is to have a lok in party that can start the event to kill the boss. The event is pretty intense and last about 7-12 minute's. Event take's place in the area Immol'thar is in. The gun look's pretty cool to. Any gun-using class would be glad to get this. It's got the right stats, nice damage and speed, and it looks amazing. Can anyone confirm if this gun is still obtainable? I see the BoE one says it is not but this one says it still is. Scratch that! I just read how to find it! :) Good thing I know someone whos done the achievement for it! Thing thing sure got a buff! If you happen to have a warlock with the items to summon the boss, you are able to 2 man this to get it for your hunter. You should take off all your gear before you begin. Start the event and have your friend just sit around and do nothing trying to be out of aggro range. Continue the event as normal. the candle that is active during the event will aoe everything down, so I would recommend not dpsing to avoid the possibility of hitting the boss when you summon it. Use burning rush right before you summon the boss, and keep spamming it when it auto turns off, to get the lowest hp you can. The boss does a charge so the fall damage will kill you. Log on to your hunter and quickly run to the boss to kill it. The candles AOE damage will kill the boss eventually so having the hunter already inside or near is required. Hope that helps anyone who might have this unique character situation. I obtained the gun a few days ago so it is definitely still dropping. If you do not have all three, go to 8,35 in Burning Steppes and talk to NPC Gorzeeki Ojovago. He sells all three items plus a forth that you do not need for those who have completed the quest. Poción enigmática. He may sell them to those are on the quest but not yet completed, but I cannot confirm that. Once you have all three items, go to Dire Maul west entrance (there are trees and a courtyard with a huge crystal there). You have to kill all arcane mobs surrounding each crystal to remove the barrier at the end of the instance. Go in and kill Immol'thar. I'm not sure in which order the warlock has to use the items, but you need to use Tarro de J'eevee first to get the event going. It takes a while -- maybe five minutes of imps coming at you from all directions and eventually a Dreadsteed boss comes out. Kill it and then Lord Hel'nurath comes out. He's the actual boss that dropsPalo de fuego de Xoroth. I wish wowhead would show that but for some reason it doesn't. Use Tarro de J'eevee. Wait 7 minutes. Diablillo de Xoroth and Guarda aterrador will spawn in the meantime, but you do not need to kill them. They just respawn faster when you kill them. What you have to watch are the three objects: (Bell of Dethmoora), (Wheel of the Black March) and (Doomsday Candle). Every object can deactivate itself, so that you have to right-click it to reactivate it again. When all three objects are deactivated at the same time, the ritual will stop and you have to start over with Tarro de J'eevee. During the 7 minutes, the demonic circle will be formed. It is finished when all 9 symbols are activated. The process is not quicker or slower regardless if you kill any adds or if you let one object be deactivated all the time. Then use Glifos de Xoroth. Corcel nefasto de Xoroth will spawn. Kill it. Then Lord Hel'nurath will spawn and perhaps drop this item. It took four tries for me to drop it (I got all four possible loots in these tries). If it drops the wrong item, leave the instance, reset it and enter again. Takes about 17 minutes per run with no walking speed boosts at level 100. If anyone on EU is interested in this Unique item, I can help out. I have all the items available to run this dungeon multiple times. Add my battle.tag "Frail#21963" for more information. (A tip would also be appreciated). I am trying to find a warlock who can summon the boss in EU servers(Horde/Alliance) with no luck. As a hunter main I really want this transmog, if you are able to help me please add KingAdmiral#2894 any help will be much appreciated. I wish I would have read the comments here before trying to get the gun on my Hunter, specifically the one from Rofle. But I thought I needed someone else with a Warlock, and even though I have the items on my own lock, didn't think I could get it on my Hunter without a Warlock on someone else's account who also did this quest line back in the day, and also kept the items. Fortunately for me, an old guild friend from back in the day still had the items, and he started playing again recently. Thanks FJ! Just FYI, this takes place in Dire Maul West and you can't just go there and kill the boss to clear the way to summon the Dreadstead. You have to de-activate 5 pylons by killing the elementals around them, in three different places. (Two are in the same room as Immol'thor, one in Capitol Gardens and two in Court of the Highbourne). Once the shield came down, we killed Immol'thor to clear the circle and FJ used Jeeves Jar. I am not sure if it is still important to keep the three items active, but he ran around and did so for the 7 or so minutes it took before all the glyphs were active. Then he used the Glyph and the Dreadstead was summoned. Once you kill him, the boss who drops the gun spawns. Got it on the first try. I like to collect guns and bows and I was sad I could never get this, since the Dreadstead quest chain had been removed. Really appreciate the comments that led me to realize I could still collect this one on my Hunter! I've killed the boss 3 times today with my warlock and a friend of mine. I'd like to clarify a few things. First - Since 7.3.5 the loot is personal, therefore you are (SUPPOSED TO BE*) unable to obtain the gun on any other character but a hunter. Second - you're probably thinking "I have the items, but im a warlock, and warlocks can't use guns, so i really have no way to do this without finding a warlock that has the items and is willing to help me". Well you're wrong. The tactic is as follows: The warlock goes inside, disables all crystals and kills the boss in the middle, summons the 3 relics and empowers the Circle. Another player gets inside the instance, the warlock passes him lead and summons the dreadsteed. Then logs his hunter and walks inside like a boss. At this point you can kill the boss and loot without issues. So far, as i mentioned, we've done it 3 times, because its quite time consuming and boring. 1 hunter (me)/1 warrior (my friend). *A super weird thing happened here - my friend got a staff from the boss, even tho he's a warrior. There were no other drops, just that staff. We might try again soon, i will report any progress here. Personal loot has increased the time required to get this item by a ton. Back in the day this boss used to drop 2 items at once, now drops nothing. I've killed the boss 3 times today, summoning him with my warlock and killing him on my hunter, while being in a group with a friend of mine, that was playing on his hunter as well. I'd like to clarify a few things. First - Since 7.3.5 the loot is personal, therefore you are unable to obtain the gun on any other character but a hunter. This appears to be false. Read on. Second - you're probably thinking "I have the items, but im a warlock, and warlocks can't use guns, so i really have no way to do this without finding a warlock that has the items and is willing to help me". Well you're wrong.The tactic is as follows: The warlock goes inside, disables all crystals and kills the boss in the middle, summons the 3 relics and empowers the Circle. Another player gets inside the instance, the warlock passes him lead and summons the dreadsteed. Then logs his hunter, gets invited, and walks inside like a boss. At this point you can kill the boss and loot without issues. There's another way to do this. Read on. A super weird thing happened during the first run - my friend got Manto diabólico from the boss, even tho he's a hunter. There were no other drops other than the shoulders. Personal loot has increased the time required to get this item by a ton. Back in the day this boss used to drop at least 1 item, now could drop nothing. Edit 1: If you're the warlock you can find a way to invite a hunter alt of yours in a party and then clear the dungeon and summon the boss on the warlock, while relogging on the hunter just for the kill. Then just go out with both characters -> Reset -> Repeat. Third - turns out personal loot doesnt apply for this boss. Using the above method i managed to kill the boss twice, both times getting Brazales viles endurecidos. Edit 2: Got the gun after 1 more try. So it took 6 attempts.